Got data? Not sure what to make of it? 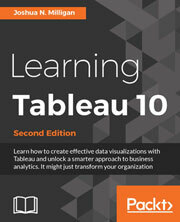 This is the guide for you – whether you&apos;ve been working with Tableau for years or are just beginning your adventure into business analytics. We&apos;ll make sure you&apos;re well prepared to take full advantage of Tableau 10&apos;s new features. Whether you&apos;re an experienced data analyst that wants to explore 2016&apos;s new Tableau, or you&apos;re a beginner that wants to expand their skillset and bring a more professional and sharper approach to their organization, we&apos;ve got you covered. Beginning with the fundamentals, such as data preparation, you&apos;ll soon learn how to build and customize your own data visualizations and dashboards, essential for high-level visibility and effective data storytelling. You&apos;ll also find out how to so trend analysis and forecasting using clustering and distribution models to inform your analytics. But it&apos;s not just about you – when it comes to data it&apos;s all about availability and access. That&apos;s why we&apos;ll show you how to share your Tableau visualizations. It&apos;s only once insights are shared and communicated that you – and your organization – will start making smarter and informed decisions. And really, that&apos;s exactly what this guide is for. Practical yet comprehensive, this Tableau guide takes you from the fundamentals of the tool before diving deeper into creating advanced visualizations. Covering the latest features found in Tableau 10, this might be the guide that transforms your organization.